Ball Hitch On Front - Reach It! - Move It! - Crush It! An easier way to move trailers, trailer mounted work platforms, boats on trailer etc. on yards. 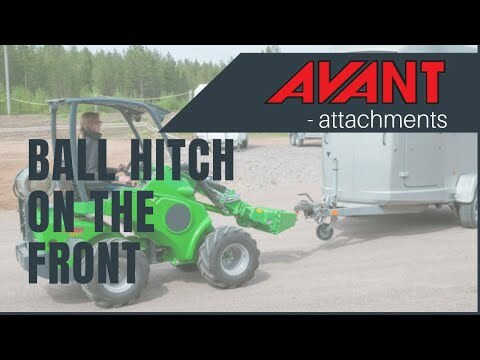 Thanks to the perfect vision to the ball hitch it is very easy to couple a trailer by just driving the ball under the trailer and locking it in the coupling by lifting the boom of the loader. Equipped with both a 50 mm ball hitch and a towing pin for lunette ring type trailer couplings.